110% up to 1.5BTC + 250 Free Spins on your 1st deposit. FortuneJack is an online casino that offers provably fair gaming, a secure site, and a player loyalty program that goes above and beyond what is customary in the online gaming atmosphere. With a sleek website that’s easy to navigate, it’s a great fit when it comes to having a safe online experience, while at the same time being rewarded for playing. One of the best features of FortuneJack is that it contains rules for each of the major games it offers (such as Keno and Binary Trader). This helps understand what is going on and how the game works, even without having to play it first. It also works to clear up any confusion that may otherwise be present. A provably fair system has been implemented that makes verifying rolls extremely easy. It also contains exact information on how the rolls are created, such that players can make their own script to verify the data. Being that this is done differently on different games, it contains it for each separately. Registration and anonymity is taken seriously at FortuneJack as well, with nothing needed but a username and a password. For players that want even more security, a security question authorization can be added – but this isn’t a requirement. While some of these games may look familiar, there are also some that are unique to the site or are rarer. Examples of this include Binary Trader and dice. With the live games and the others, it reaches a much more broad range of player interests. Deposits and withdrawals are both handled instantly, though withdrawals require a minimum of 0.001 BTC. FortuneJack covers all fees, so withdrawing is free as well. This helps open the doors for players that otherwise wouldn’t be able to play. FortuneJack has both a promotion and a loyalty program for players. The promotion is a first deposit bonus of 100%, up to 1 BTC. FortuneJack is a cryptocurrency casino pioneer. A leader of the niche, FortuneJack fostered a community of like-minded players by providing the features that make carefree cryptocurrency gambling second nature. From the selection and quality of games to the promotions and security technology, this is the most transparent, trusted, and thrilling place to place bets. The FortuneJack team was founded with over 20 years of gambling industry experience – a portfolio that spans some of Eastern Europe’s most renowned land-based and online casinos. FortuneJack mission was to take all of the features we and our bettors loved about online gambling, take it to the next level, and make it specific to cryptocurrency players. Over 500 games are being offered by FortuneJack, and all of which are provably fair. They have classic games as well as the most popular video games like roulette and video poker. Here are some of the games that FortuneJack offers: Keno, Bingo, slot machines, fortune wheel, dice and live dealer games. The live dealer games are our personal favourite! Playing with an actual dealer is surreal as if you are actually playing inside casino. Live dealer games includes Texas Hold’em Poker, Blackjacks, Sicbo, and Baccarat among others. FortuneJack partnered with the industry’s leading and most renowned software providers, offering you both quantity and quality – the best of both worlds. With Microgaming, Evolution Gaming, Playson, XPG, and so much more (and many more to come), we have the best of the best. And with progressive jackpots that can be upwards of 30 BTC, the winning potential is life-changing. Once you join, keep a look out for binary trading and multiplayer poker as well, as both are currently under development to ensure the highest possible quality and excitement. FortuneJack is private, offering full anonymity for our bettors, and FortuneJack safety protocols are controlled by leading security firms and a monitoring team with years of gambling industry experience. For any questions, concerns, or clarifications, our friendly and knowledgeable live chat is available 24 hours a day, 7 days a week. All new and recently joined players can use the unique welcome bonus package, which starts from 130% to 1 BTC bonus on the first deposit, as well as an additional 250 frisinas and continues with incredible surprises for the next four deposits, each of which activates a 30% bonus up to the amount up to 2 BTC! Every week, FortuneJack conducts special, time-limited, exclusive promotions and campaigns with generous gifts, prizes and incentives for some simple actions from the players. Absolutely every casino player has a great opportunity to increase his bankroll. To do this, the player just needs to play their favorite slots and board games, but they will compete with all the other players. Then, every weekend, the results will be summed up and the players who occupy the highest positions in the special rating will receive rewards in accordance with their gaming activity and points accumulated during the week. If you wish, you can join the loyalty program FortuneJack, where absolutely for every bet made in any casino games you will receive loyalty points. Once you accumulate 100 points, they will be converted into real bitcoins and credited to the balance of your gaming account. The program consists of four vip levels: bronze, silver, gold and platinum, and for each new, higher level, the player will be placed more profitable bonuses and rewards. Immediately, all new players can start with a 130% deposit-matching Welcome Bonus up to 1 BTC. Every day, you can win 1,000 mBTC on the LuckyJack giveaway. Every week, you can win a share of 5BTC on FortuneJack community Leaderboard. Every month, players receive a 130% match bonus for their first deposit of the month. All year, FortuneJack offer free spins, giveaways, deposit bonuses, reloads, and other promotions to give you extra bankroll boosters on a consistent basis. Join here, and start a new chapter in online gaming, where unrivaled, imaginative entertainment is just a few clicks away. 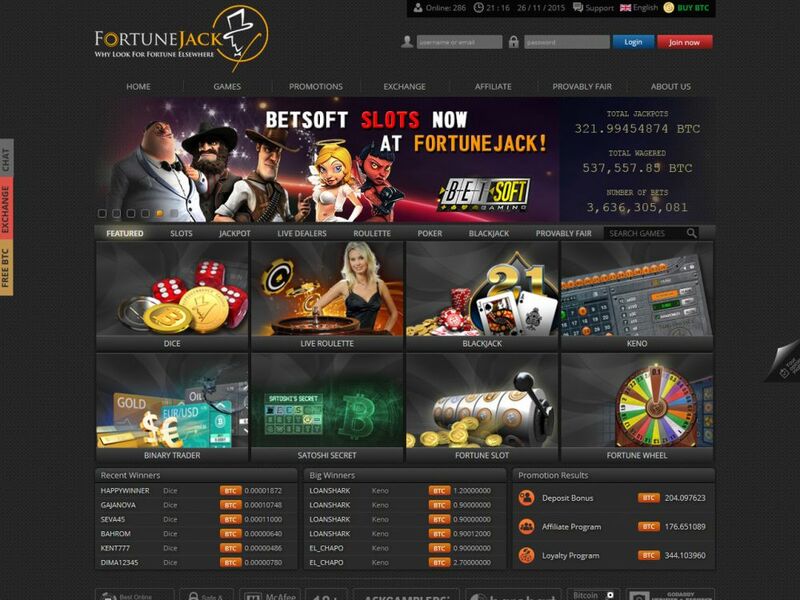 FortuneJack is a true crypto-currency-only online casino. FortuneJack accepts Bitcoin, Dogecoin, Litecoin, Dash, Ethereum, Monero and Zcash.. FortuneJack also accepts certain e-wallets namely OKPay, Payeer, and Interkassa. FortuneJack has mixed reputations online. Some believe it’s one of the best casinos, while others think it’s a waste of time and money playing in it. In our opinion, we think that FortuneJack is a solid online casino. There are just certain areas that it needs improvement on but it does not really affect gameplay and transactions in a huge way. We do agree with most people that FortuneJack needs to up its game in order to stay relevant in the world of online casinos.